Installation of Fixed Cone Valves - Gilboa, N.Y.
Jett Industries, Inc. was contracted to install client procured 36-inch diameter fixed cone valves and upgraded hydraulic power units at the Blenheim Gilboa Power Plant for New York Power Authority. This system is utilized to control low flow release through the lower reservoir dam of the hydropower plant. 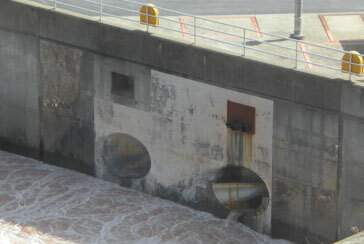 The valves are located in a concrete vault and discharge to atmosphere in the spillway basin. Work included removal of two existing 36” cone valves, stainless steel hydraulic piping, and power units and install of two new fixed cone valves and upgraded hydraulic system. Project considerations included coordinated planning for the execution of work safely due to a failing upstream 72” isolation valve and client concerns of high reservoir levels with increase hydraulic pressure. Work had to be performed sequentially as one unit had to remain in service at all times, requiring all start up and operational required functions to be optimized and acceptance prior to commencing. Work scope included installation of approximately 230 lineal feet of half-inch diameter stainless steel tubing, pressure testing and flushing piping system to cleanliness levels meeting ISO 16/14/11. Jett worked closely with NYPA staff members to address all project critical milestones, site security, quality workmanship, valve performance and with meeting all safety requirements.